The most noticeable difference between a kitchen and a kitchenette is the size of the area designated to this part of an apartment or home. The kitchen, more likely to be the cooking area of a larger house, is usually a separate room fitted out with all the equipment needed to cook and wash up for family meals. A kitchen would be a vital part of a catering or restaurant business where food is prepared in larger volumes. A kitchenette, is likely to be part of an open plan arrangement in an apartment or smaller home. The kitchenette offers some equipment, but all the facilities are scaled down to be part of a smaller area. The kitchenette is dedicated to simple cooking in a restricted space. The kitchenette is a mini kitchen and not designed for large catering activities or for bigger families. Kitchenettes do not have the space or the extra appliances and are therefore not set up for more demanding catering needs. A Kitchen is an area of a house ,or catering establishment, that is fully equipped for cooking and providing for the nutritional needs of a family or for professional catering. Family kitchens may vary in size, but will have all the electrical requirements for cooking, refrigeration and freezing. A kitchen may have a dishwasher and other appliances, depending on the design and needs of the family. Catering kitchens in restaurants and hotels will be equipped with more specific appliances to suit the customers and size of the establishment. A standard kitchen should have a four plate stove with oven, a fridge/freezer, and a dishwasher. Washing up facilities and a microwave oven would be part of the kitchen and there would be more storage space and work surfaces. What are advantages and disadvantages of a kitchen? A kitchen offers a separate room kitted out according to the cooking or catering needs of the family or establishment where the kitchen is built. A kitchen sometimes includes family eating space conveniently placed withing the kitchen area. A kitchen has storage space to pack away kitchen utensils and dishes. It is separate from the living area. A kitchen needs more work to keep it clean and tidy because it is larger and comes with more facilities and area to keep clean. A kitchenette is a small area in an apartment designated to allow some cooking activities. The designated area is less than 7.4m (80ft) according to the New York building regulations. A kitchenette is part of the living space and fits into the decor and furnishings of the apartment or open plan style of house. The kitchenette does not always have the full range of equipment you would expect in a full kitchen. A kitchenette would not suit a catering or hotel environment because it would not cope with volumes of cooking. A kitchenette, with some clever design and decor ideas, can become a feature of the living area. A kitchenette is best suited to apartment living and smaller homes. What are the advantages and disadvantages of a kitchenette? A kitchenette does not have the full compliment of kitchen equipment and is a much smaller space as it has to fit into a smaller environment. A kitchenette makes use of smaller spaces to provide an economical cooking area. A kitchenette brings cooking and eating into the open plan living area. Although it is easier to keep clean it is visible to the living room and part of the entertainment area. This visibility means the decor and facilities need to fit in with the living space. The kitchenette needs to be seen as a feature. Cleverly blending in with the other furnishings makes the kitchenette look like part of the living area. The kitchenette does not have as much storage space as a full kitchen. The kitchenette is a smaller area and part of the whole living space in an apartment. A kitchen is a separate room with a full compliment of kitchen equipment. The kitchen is designed to be a room in a house used for cooking and storing kitchen equipment. A kitchen can be a catering facility. A kitchenette is designed to make use of the minimum amount of space and be decorated to fit in with the living space of an apartment. A kitchen would be fitted with a stove and oven and a refrigerator with freezer. Many kitchens have microwave ovens and dishwashers. Kitchens have more storage space and commercial kitchens are designed to cater for large numbers of people. A kitchenette may only have a microwave and a kettle or perhaps a two plate hotplate and a single washbasin. A kitchenette is fitted to be part of a living area with less storage space and fewer fittings. The Kitchen is well suited to family living, enthusiastic cooks and catering. A kitchenette is well suited to allowing some cooking activities in a smaller space or apartment. 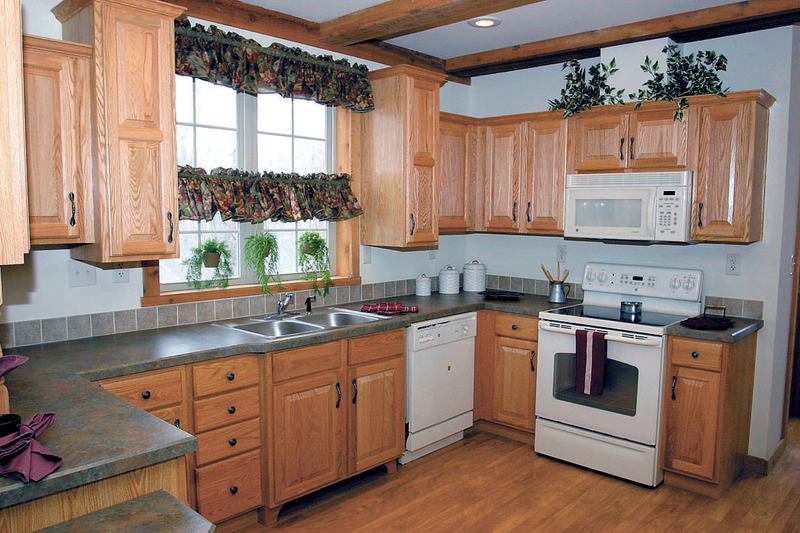 Kitchens and kitchenettes are utility areas of a home or apartment. The kitchen being larger in size and an independent room in the house, while a kitchenette is a smaller area and part of the living space. Each area has its purpose of providing cooking facilities in either a small apartment or a bigger home. Kitchens, with more appliances and storage space, are suited to family homes and restaurants and hotels. 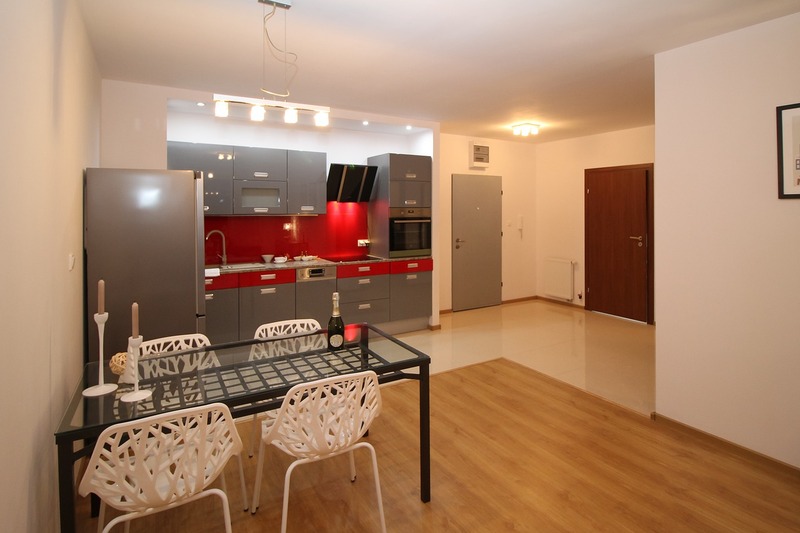 Kitchenettes are ideal cooking areas in small apartments, suited to students single tenants and busy working couples. Some occupants of homes or apartments prefer kitchenettes because of their easy clean and simple catering options. The modern kitchenette is designed to fit in with the decor of the open plan apartment and is generally easy to clean and maintain. It may include an eating area or breakfast counter to facilitate a simple catering and a dining area. Large kitchens often offer a breakfast nook or small eating space to combine the act of cooking and eating all in the kitchen area. A kitchen is a well organized catering area either for a household or for the hospitality business. It will have more appliances and a proper stove with an oven. The kitchenette does not offer the same extent of facilities and appliances for the needs of an enthusiast or for catering for large numbers. Kitchenettes, seen as miniature kitchens, are part of the modern apartment life style and ideal for single living mode or couples who do not have the pressure of cooking for families. City dwellers enjoy kitchenettes because their eat out options are greater and in a busy lifestyle they may prefer to eat out than cater at home. The life style of the city dweller may eliminate the need for a full size kitchen and lean towards a kitchenette as a space saving option complimenting busy lifestyles. Christina Wither. "Difference Between Kitchen and Kitchenette." DifferenceBetween.net. 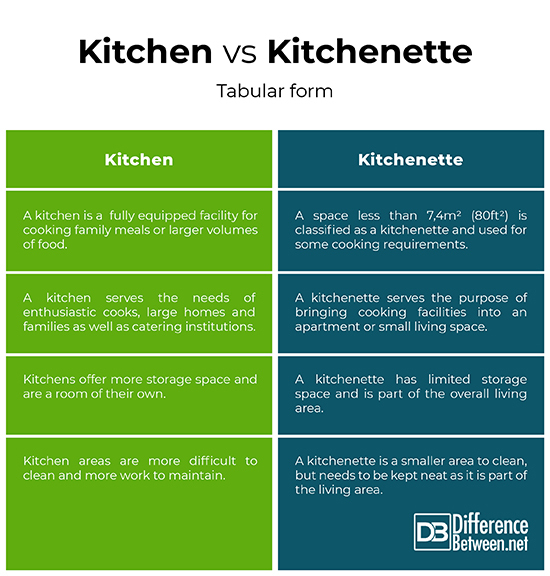 January 29, 2019 < http://www.differencebetween.net/language/words-language/difference-between-kitchen-and-kitchenette/ >. Login Andrei.Kitchen vs Kitchenette which one is for you? 24/08/2018. www.rentcafe.com/blog/apartmentliving/kitchenette-kitchen-difference. Pub. Rent Cafe. Reviewed: 30.12.2018.